Anticipation and excitement over the first-ever launch of a private spaceship to the International Space Station next month is steadily building, astronauts and NASA flight controllers said Tuesday (March 20). Private space company SpaceX, based in Hawthorne, Calif., is preparing to launch its Dragon capsule to the space station April 30. The unmanned capsule will be the first of a new fleet of commercial spacecraft being developed to deliver cargo to the station in the wake of the space shuttle retirement last year. The Dragon capsule will launch atop a SpaceX Falcon 9 rocket from Cape Canaveral Air Force Station in Florida. If all goes well, it will fly up to the orbiting laboratory, conduct tests, and then dock there May 3. "Our fingers are crossed for SpaceX to launch and successfully come to the space station," NASA astronaut Sunita Williams said during a news conference Tuesday. Williams is due to lift off atop a Russian Soyuz spacecraft July 15, along with a Russian cosmonaut and a Japanese astronaut, to serve on the space station's Expedition 32 and Expedition 33 missions. "We're really excited," said Williams, who will command the space station's Expedition 33 crew. "Aki and I actually went to California about a year ago for some training with SpaceX and had the opportunity to look around at the company and at what they were doing on the floor building the spacecraft. That was pretty awesome and to see a bunch of really excited engineers and scientists working on this spacecraft was great." Hoshide agreed, saying he supports the development of the commercial space industry. "Getting the commercial sector involved, I think it's a good thing," he said. "It opens up new doors. I'm looking forward to that very much." Yet on the same day that astronauts lauded the private spaceflight rise, members of Congress expressed concerns over the safety and risk of new commercial vehicles during a hearing before the House Subcommittee on Space and Aeronautics. And SpaceX isn't the only company joining the new private space effort. In addition to the California company, NASA has awarded a contract to Orbital Sciences of Dulles, Va., under the Commercial Orbital Transportation Services (COTS) program. Orbital's Cygnus vehicle could make its first launch to the space station on Sept. 1, with a docking Sept. 6, said NASA's space station program director Mike Suffredini. But first, all eyes will be on SpaceX next month, as it prepares to make a significant step forward in the new partnership between NASA and the private sector. Still, the mission is still a test flight, and Suffredini emphasized that spaceflight is always a risky business. 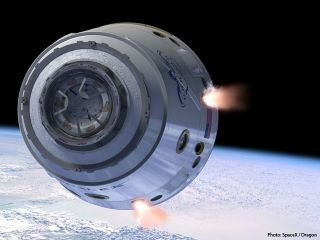 "You want every flight to work exactly as you planned it, but we had initially planned on two demo flights, so if something happens during this flight regardless of what that is, we will learn, SpaceX will learn," Suffredini said. "We need to be careful not to assume that the success or failure of commercial spaceflight is going to hang in the balance of a single SpaceX flight." And SpaceX isn't content to use Dragon for delivering only food and supplies. The company hopes to eventually upgrade its capsule and rocket system to carry people to orbit, including NASA crews to the space station.